Katie Fforde is one of the authors who got me reading again as an adult and so her books are dear to me and I look forward to her new releases every year. Her new release A Rose Petal Summer introduces us to a delightful host of characters as well as some charming settings from a Chateau in France, a barge in London and a country estate in Scotland. I loved the mix of characters in this book from the grumpy Murdo to the adorable sheltered Rowan who is eager to spread her wings and a celebrity couple who bring a modern touch to the storyline too. Alec and Caro have a dreamy fairy tale storyline that I loved and it warmed my heart. What I have always loved with Katie Fforde’s novels is the cosy feel good and uplifting style she always has in her storylines and this still flows through the storyline in this book. Although the storyline was predictable, I still found myself wrapped up in the romance and friendship that is at the heart of this book. 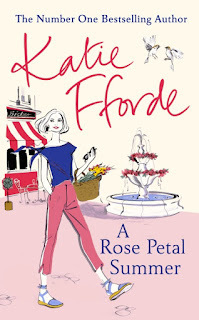 Katie Fforde has delivered another beautiful heart-warming storyline that I thoroughly enjoyed.